Wireless Access points are a risk due to poor or no security, with the end result being that many home users and small businesses may be at risk from loss of bandwidth, data, and identity theft. The key benefit of using a discovery tool like this, is that it will save money and reduce the risk of identity theft, fraud etc. "We know who is accessing our wireless router. Do you know who is accessing your wireless system? ", said Rob Harmer, General Manager, PCProfile of Adelaide South Australia. "Wireless Access points are a known risk due to no security, or poor security, and the availability of tools to hack and crack wireless security, with the end result being that many home users and small businesses may be at risk from loss of bandwidth, data, and identity theft. The key unauthorized usage of wireless routers occurs when your wireless system is used by someone else to download movies and music, for free, i.e. at your expense", said Harmer. PCProfile has designed and developed a simple, low cost detection software tool, that alerts home and small business users when a neighbour or someone else has been attaching themselves to the wireless access point and is using your bandwidth, unauthorized, for free. 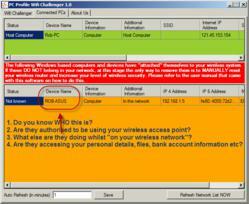 PCProfile WiFi Challenger identifies unauthorized accesses to the wireless router and creates a log file of PCs that are not authorized to use your system. "The key benefit of using a discovery tool like this", said Harmer, "is that it will save money and reduce the risk of identity theft, fraud etc." Do you know who is accessing your wireless systems? You should do. PCProfile has been in business since 1991 providing useful discovery tools covering anti-piracy of software, discovery audit and wireless discovery of PC based systems. PCProfile has won awards for innovative software design and offers practical tips on how you can cope with the rapidly changing technology scene within your business.